Auckland is home to many amazing hiking tracks (or as we Kiwis like to call them, bush walks), including a secret spot best known by locals; the Goldie Bush Walkway which adjoins the Mokoroa Stream Track and Mokoroa Falls Track. A great example of natural beauty, this accessible spot makes an excellent day hike. Situated between the Waitakere Ranges and Muriwai, three gorgeous individual tracks combine to form a unique and striking circuit. It’s hard to believe that such an untouched (and relatively unheard of) trail can exist so close to New Zealand’s largest city. With countless river crossings, beautiful nikau-filled bush and native birdsong, this is a memorable hike in so many ways. Whether you live in Auckland or are passing through, the Goldie Bush Walkway is a fantastic way to spend a day. Which Direction Should I Walk the Goldie Bush Circuit? Though the tracks can be completed in both directions, we recommend heading clockwise (along the Goldie Bush Walkway – Mokoroa Stream Track – Mokoroa Falls Track). This minimises the elevation gain at the end of the hike (as you’ll slowly gain elevation as you walk upstream), saves the waterfall until near the end of the hike and will keep your boots dry for as long as possible. The following assumes that you hike in the same direction that we did around the Goldie Bush Walkway, starting from the Horsman Road carpark. If you’d like to see a detailed rundown on our hike, we recorded it on Strava. A beautiful hike under cover of native bush, you’ll spent the first 35 minutes hiking downhill towards the stream. The track itself is well-formed, with a significant number of steps towards the end of the track. At the bottom, after crossing over the footbridge, you’ll have the option to either turn left onto the Mokoroa Stream Track or to continue along the Goldie Bush Walkway. We were keen to get right into the water so didn’t continue any further along the Goldie Bush Walkway, but should you want to, you’ll walk another 45 mins or so, returning back to that point. 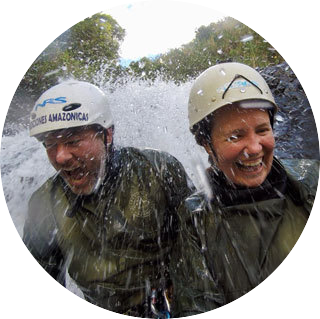 Criss-crossing back and forth over the Mokoroa Stream, you’ll want to prepare to get wet (and possibly a little muddy)! Though the first few stream crossings were fairly minor, we soon realised there was no hope of keeping our feet dry. In some areas, the water was almost up to our knees. This is definitely the most time consuming part of the hike, but in our opinion, also the most worthwhile. Hiking along and through the stream is slow going (as you’ll want to be sure of your footing) but so, so much fun! Though this part of the track is completely optional, it was definitely the main appeal for us. Pro Tip: If you want to stick to more traditional trails, simply double back along Goldie Bush Walkway and join the Mokoroa Falls Track. Whatever you do, don’t follow the signs at the start of the Mokoroa Falls Track blindly! If you’ve followed the stream in a clockwise direction, you’ll get to the end of the Mokoroa Stream Track and notice the signs that direct you up and to the right onto the Mokoroa Falls Track. Yes, you will want to head up there eventually but first be sure to follow the stream a bit further up to see the falls from the ground level. Then and only then, you’ll want to double back and take the track up to the viewing platform before beginning the hike back to Horsmans Road and your awaiting car. Though the Goldie Bush Walkway is an easy drive from Auckland, public transport to the area is non-existent and you’d be unlikely to Uber. With that in mind, you’ll need either your own car or a rental when heading out to the Mokoroa Falls. The Goldie Bush Walkway can be accessed from two main points in West Auckland; either from 6 Constable Rd or from the end of Horsman Rd. We hiked from Horsman Rd which put us directly onto the hiking trail, ready to loop up. Both work well, it’s just a matter of how much you’d like to walk (and how many hills you want to contend with). How Difficult is the Goldie Bush Walk? Both the Goldie Bush Walkway and the Mokoroa Falls Track are considered easy-moderate hikes. The tracks themselves aren’t at all technical and are pathed the whole way (either with gravel or wood), though both include a reasonable gradient gain/loss (including both stairs and steep slopes). The Mokoroa Stream Track, by comparison, is relatively flat but due to the number of river crossings and uneven surfaces around the stream, it is considered a track for experienced hikers. With that said, we’re not particularly experienced, nor am I very coordinated or fit, but I managed it absolutely fine. If you’ve got a sense of adventure and don’t mind getting wet feet, in our opinion, experience really isn’t necessary at all. What Impact Has Kauri Dieback Disease Had on the Area? New Zealand is fortunate to have many stunning native trees. One of which, the mighty kauri, can grow up to 50m high, have trunk girths of up to 16m and can live for 2,000 years – they are absolutely incredible. Sadly though, our beautiful kauri are facing challenging times. Kauri dieback disease is causing major damage to our kauri communities and, at present, there is no cure for the debilitating disease. Earlier in 2018, a rāhui was placed over the Goldie Bush Reserve tracks, in a bid to help prevent the spread of Kauri Dieback disease. That closure has since been lifted, but it’s incredibly important to abide by the rules setforth by the Department of Conservation. Use only the marked tracks (as actioned have been taken to reduce mud and the transfer of Kauri Dieback). It only takes a few minutes to help do your part whilst visiting our beautiful reserves. The Goldie Bush Walkway is an awesome example of New Zealand nature in and around a large city. With river crossings, gorgeous bush and the perfect combination of easy and more challenging tracks, this is a day hike that really offers bang for your buck. It’s memorable, unique and lots of fun. This entry was posted in Auckland, Hiking, New Zealand, Oceania. Bookmark the permalink.